For the most part we try to avoid selling time, and try to sell value. However value based pricing is dependent on perceived value, a subjective judgement. On the other hand so are wages which are set in industrial awards and federal minimum wages. So at the very simplest we have a subjective pay-rate, “pulled out off a hat” as it were multiplied by an estimate of time required to do the job. If the job has been repeated multiple times, then the time for the job, will have a lower and upper limit for the time. The use of an average time for the job, hopes to balance the longer job durations against the shorter job durations: if this doesn’t pan out in practice then something other than an average needs to be used. Whilst value-based pricing is typically touted for the purpose of increasing the price of goods and services, in the following examples it is primarily used to reduce the price. The idea being that technology has changed, and those wage rates “pulled out off a hat” no longer represent value, and thus fees determined by multiplying such rates by work duration also no longer represent value. Take the cold-formed shed industry and cold-formed light steel framing industry. These industries now have sophisticated software, often allowing salespeople to design in 30 minutes or so whilst talking to a customer at point-of-sale. Thus 2 weeks to provide drawings and calculations at rates of $180/hour are just ludicrous: the value isn’t there. However, want a feature outside the capabilities of the software, then back to the 2 week scenario, starting from scratch, even though only a minor change. It represents an inefficiency in the industry, and people don’t want to pay for such inefficiency: thus expect that there will be a monetary penalty. We therefore need insight into what proportion of the fee (price) is adjustable and the absolute minimum at which the business can be sustained. For example given that our former BAS accountant charged $90/hour, I could just adopt $110/hour without question. But are the prices generated by these numbers acceptable and when they are not acceptable why aren’t they acceptable? The approach taken doesn’t tell me why, but it does provide insight into people’s changing perceptions of value, including my own perception of value. Most of the examples are routine standard approaches, with the later examples introducing value-factors to allow adjustment of the estimated price based on perceived value. At various times we check the internet, the Australian Bureau of Statistics (ABS) to get a picture of wages and prices charged by others. Often prices are not disclosed, so we check websites which provide ranges, or look at similar services or physical products. For example searching the internet can find building design and drafting service businesses offering to produce drawings for a simple structure (eg. carport) for around $1200. Whilst businesses with sophisticated software can push numbers to produce calculations for a steel framed shed for $990. The main difference between a shed and a canopy is that the shed has wall girts whilst the canopy doesn’t. Taking all things into consideration, those calculations removed and those added due to the differences, the total time for simple buildings and simple canopies is about the same: therefore expect time based fees to be the same. Therefore simple calculation is $1200 + $990 = $2190 for drawings and calculations. Bringing subjective judgement into play this seems too high. But is it? For the federal minimum wage a 25% loading applies for casual status, which basically is a good enough starting point allowing for contract work and need for business to find work. The federal minimum also based on 52 weeks at 38 /hours/week: or 1976 hours/year. Which whilst they get paid for these hours they don’t actually work all these hours due to public holidays, sick leave, and paid vacation. Therefore the billable hours are less. Additionally, the business has to cover its own operating costs: buildings, equipment, software, national standards, reference books. Further there are non-billable hours expended on building the business: marketing, training, administration and quality assurance. Many of these costs are variable and discretionary, not so easy to classify into fixed costs and variable costs: and to secure and stabilise the business also need to invest in its future. So simplest approach is to adopt the concept that at the very minimum the business is equivalent to person on the federal minimum wage. Currently $18.93 /hour [23/03/2019]. 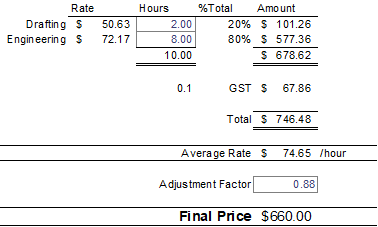 Ignoring the 25% loading and GST, the minimum charge out rate for a structural drafter is $22.79+$18.93=$41.72, whilst that for the structural engineer is $35.71+$18.93= $54.64. Whilst if take the 25% loading into consideration get: [$52.15, $68.30]. In both sets of calculations the federal minimum wage has been used as applied overhead. M=0 has not practical to track materials, therefore E=L+OH. Of course if we had personal incomes which better match those on payscale rather than the federal minimum then expect that f<0.4. But will stick with this value for the time being. So failing to take the non-billable time into consideration the charge out rate for structural engineer is: 1.67 x $35.71 = $59.52, or at federal minimum rate 1.67 x $18.93 = $31.55. Both of which are equivalent to having adjusted the billable hours: which is partially to be expected. But does raise the question as to whether better personal incomes from higher revenue, can reduce the fraction ‘f’ lost to overheads. In the above calculations the operational overheads also seem high. A rough estimate is that other expenses covered by a base figure of $15,000. If this figure is distributed to fees as an applied overhead based on billable hours, then it will increase or decrease dependent on the workload. So assuming reduced hours of approximately: 1185. Then the applied overhead is $12.65 /hour. If actually get to bill 2000 hours, then will generate 12.65×2000 = $25,303.64, which covers the base allowance and additional variable costs. Overheads can be broken down into fixed costs and variable costs. As an example consider that office lease is at $1200/month, and so costs $14,400/year. Whilst other expenses are $15,000/year. The office lease is a fixed expense and doesn’t vary with increase in workload, or at least not until the point at which require larger office for more people. The other expenses are variable and increase or decrease with variation in workload. So it doesn’t matter whether have 1, 2, 10 or more people working, the other expenses increase in proportion to number of workers. That is if have 2 people working then the expenses become 2 x $15000 = $30,000. So assuming one person works 2000 hours (50 productive weeks/year x 5 days/week x 8 hours/day = 2000 hours/year ). Then hourly charge out rate is $15000/2000 = $7.50/hour. The fixed cost however doesn’t change with workload but is recovered relative to the workload. If have one person billing time, then charge out rate is $14400/2000 = $7.20/hour. But if have 2 people working then can distribute to 4000 hours of billable time, and so $14400/4000= $3.60/hour. Thus the more people working from an office, and the more shared resources the lower the fixed portion of the overheads per billable hour. So sole practitioner, or family business working from home, without need to add extra rooms to the house for operating a business is an important cost reduction measure. If add an extra room as is often the case, then the sole practitioners expenses are potentially higher than the typical consultancy which employs 5 people (around 80% of such businesses). That is $14,400/(5*2000) = $1.44 /hour. Assuming that leasing an old house, provides adequate space for 5 people. Other overheads concern employment of receptionists, administrative personnel and others whose time is not directly billable to projects. Assume employ one person at $20/hour for 2000 hours/year = $40,000/year. This cost is recovered from the billable hours as part of the applied overhead. As with the fixed cost of the office lease, the more people who share this resource, the lower the associated applied overhead. So if only one person billing time, the applied overhead is $20/hour. If 5 people then it reduces to $4.00/hour. Or make that 4 people billing time, and the receptionist makes the 5th person: so applied overhead=$5.00/hour. So assume receptionists time is split between the four people equally, therefore 2000/4=500 hours per person. Therefore a sole practitioner can expect to lose 500 hours/year from billable hours, or otherwise work another 500 hours outside normal working hours. Most of the administrative type work would need to be during normal hours, whilst the design work can be after hours. So the workload either remains at 2000 hours, or increases to 2500 hours. If it remains at 2000 hours, then 500 hours is no longer billable and billable time reduces to 1500 hours. So assuming a desired salary of $60,000 and ignoring overheads, the basic charge out rate would be $60000/1500=$40/hour. But if workload increases to 2500 hours then would typically expect an increase in income. So assume $60,000/2000 = $30/hour. Therefore expected revised income is $30/hour x 2500 hours = $75,000. which is to be recovered at the rate of 2000 billable hours, thus charge $75000/2000 = $37.50 an hour. Then again consider the extra 500 hours only worth $20/hour, so total desired income increases by 500 x 20 = $10,000, to give $70,000. Therefore charge out rate is 70000/2000= $35/hour. Opportunity costs? In the first case assuming the value of the hours lost to admin and other tasks are worth the same as the value of the billable work which could be done. Such however doesn’t really represent the value of the work being done. Have 1500 hours at $30/hour and 500 hours at $20/hour, to give total of $55,000. Not the desired salary seeking, so the 1500 hours needs to be worth more than $30/hour, the result would be $33.33/hour (the charge out rate is $40/hour). Now that is all based on 8 hours/day. Consider industrial awards now reduce working week to 38 hours, or 7.6 hours/day, and 1976 hours/year. Therefore admin hours 1976/4=494, and hours remaining are 1482, and the value of the labour only increases to $33.82/hour (charge out $40.49/hour). But if a receptionist spends their time in proportion to billable hours, then the more billable hours the more time spent on reception and the the fewer billable hours the less time on reception. Ignoring that if have fewer billable hours more receptionist time may be expended on marketing type activities. So if 2000 hours of billable time requires 500 hours of admin time, then 1500 hours requires less admin time: assume simple straight line relationship, such that zero billable relates to zero admin. 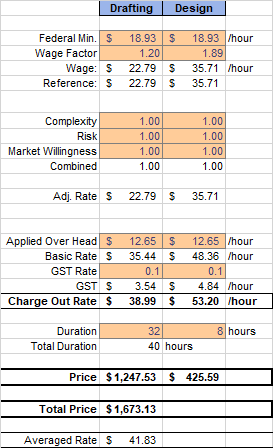 Thus at the rate of 0.25 hours of admin for each hour of billable work, the new distribution is 1600 hours billable work to 400 hours of admin, for total workload of 2000 hours, and the charge out rate for the $60,000 becomes $37.50, with labour rate $32.50. Here product refers to goods and services. To stay in business need to design, development and implement the supply of new products. This may involve time spent training and becoming familiar with new technologies, new codes of practice or revised codes of practice. Additionally there is developing the tools to assist with the production work: for example writing software or creating MS Excel workbooks. This development effort may occur between projects or integrated with a project. When integrated with a project, the project gives rise to the needed tools, but such tools will be suitable for future projects. Therefore we could reason, that the full cost of the effort shouldn’t be assigned to the current client. Then again no guarantee that will get any future work which is similar. But if were a manufacturer no guarantee that $1 billion (1.0E9) investment in design of a car would result in adequate sales. So taking a look at that, assuming productive capacity 100,000 units per year, and economic life of a model is 5 years. Then every 5 years need to develop a new design. So expect to sell all production, therefore 500,000 units is used for recovery cost (ignoring the concept of sunk cost). Then development costs are recovered at the rate of $2000/unit. Then assuming total sale price of vehicle is $30,000, then development cost is 6.7% of the price. The percent of revenue invested in research, design and development, varies between industry and also individual business. The main number I remember is from the book “made in Japan”, where it was indicated Sony invests around 5% to 6%. Research around the internet suggests that can rise close to 25%, but may be as low as 1% to 2%. We are not a high tech company, but compared to others we do produce a lot of our own design tools rather than buy off-the-shelf. So our expenses are lower but development costs are higher. Those who buy off-the-shelf software also have to invest in training in the use of such software. Whilst our training occurs at the same time as developing the software. I therefore think another 20% of time expended on non-billable work is reasonable (Also noting that I am not allowing for public holidays, sick days or paid vacation. Mostly because work through public holidays. Also if sick then cannot do the development work, therefore development funds are available to cover sick days.). The labour rate for the RD&D work is valued at the same as the billable work as based on the same skill set. With such an adjustment the non-billable administration time is reduced and the billable time is increased, resulting in a lower overall charge out rate. Noting that thus far this only considers the wages, the labour costs of operating the business, it doesn’t consider other expenses: the office, paper, ink, computers, software, national standards etc. So taking a different approach than above, the expenses add to the required total income. So there was $14,400 for office and $15,000 for other expenses. So an extra $29,400 to add to the wages bill, to give a total of $89,400, to be recovered by the billable hours, requiring a charge out rate of $70.69. So now have a relatively high charge out rate call it $70/hour, add GST to make it $77/hour, seems relatively high, but is less than a BAS accountant at $90/hour and their education is a fraction of required to do our work. The issue however is the buyers perceived value. I know that a typical certificate of structural adequacy from elsewhere is likely to cost around $600 with or without GST. Assume have a $1000 of decking and one beam which is outside the framing code (AS1684.2). One beam and associated connections and supports, for something as simple as a decking likely takes no more than 1 hour. So that is average rate of $600/hour. Of course if it fails, then that is likely $1000 of scrap material, then all the associated costs resulting from the failure: such as injured people. However few people understand the risk or insurance component of the exercise. As far as they are concerned, $600 is too high for the project. The project is viable at $1000, but not at $1600. The simple solution is for the building designer or drafter to get rid of the beam causing the problem, and find a solution which retains compliance with AS1684.2. If not willing to do that then problems compounded, as the solution is unlikely to be timber, it’s more likely to require a steel beam. The costs of materials will thus increase as well as the cost of design and documentation. As I have indicated elsewhere, the design effort is not proportional to the size but to the complexity, thus if retain the same structural form, then as increase size, the design effort remains the same. However the value of the building increases, and therefore the loss on failure is higher. So percentage fees are often charged: based on the RD&D investment figures expect the percentage to be from 1% to 25%, typically close to the lower end. So 1% of $1000 is $10, which isn’t going to cover the cost of drafting and design. Minimum cost of drafting would include around 1 hour site measure up, and 1 hour actual drawing: say 2 hours at $25/hour = $50. So DIY saves $25 to $50, depending on whether only do measure up and employ drafter, or do both measure up and drafting yourself. But no design involved. Assuming design is for everything, then have posts, bearers, joists and decking (flooring): that’s approximately 4 beams, with connections and supports. 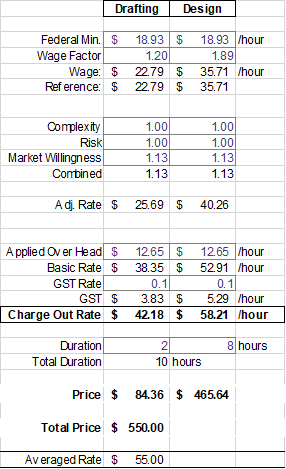 So approximately 4 hours work, at say a rate of $40/hour (ignoring all other expense at moment), then cost is 4×40=$160. So overall cost of design and documentation is around $160+$50=$210, or excluding site measure up, then $160+$25=$185. That is 210/1000=0.21, or 185/1000=0.19, or 19% to 21% of the value of the structure. But these figures don’t work as the value of the structure increases. However once we have our budget we can relatively easily distribute our costs between design and the structure (or other physical object). So assuming we have $5,000 budget for a small building project, from memory at one time this use to be a upper limit before building license required. So first we have to spend something on design, and also on development approval. Development approval fees are based on areas and also include complexity factors. For simplicity will keep this as part of the design and documentation fees, though the designer may not include development approval costs in their fees. The reason not included is because development approval is concerned with going ahead with construction, whilst design is not. Often peoples dreams are bigger than their capabilities, and so they don’t immediately go ahead with construction. They either wait to see if can save more, and get larger loans, and if that is not possible then they start redesign, or give up and take alternative path such as buy an established house. Anycase our example is small DIY project. So from the above 1% is unlikely to provide adequate fee coverage. So now have a variety of estimates for the basic hourly rates., which are subject to variation. $72,704, which is more than the market rate. However also consider that the market rates indicate that a mechanical engineering associate (2 year qualified) gets paid more than structural engineer. The professional employees award doesn’t give much consideration to the technologies concerned with. The civil engineering drafter also gets paid more than the structural drafter, but less than the structural engineer. A mechanical engineering associate designing machinery is highly likely unsupervised and working independently, whilst the civil and structural drafters are likely supervised by engineers. Also a lot of the structural drafters are unqualified, with any available drafter being employed, hence they tend to require more supervision/guidance than civil drafters. So since I have the education for mechanical engineering associate and mechanical engineering technologist, I could scrap the above fee assessment and use the salary for mechanical engineering associate. More so, given will only have one person producing structural drawings and calculations: and this is more efficient than having drafter and engineer. Once have the fee with GST included can also calculate an average hourly rate for the project. Assume an other example, same 10 hour project but distributed: 80% engineering, 20% drafting. Now consider the project biased towards drafting. Based on the above estimates I could further estimate likely distribution of project effort between drafting and engineering and then calculate a single hourly rate for a project. Then forget about the project breakdown, just estimate total hours. In all the above calculations there has already been a value judgement. The basic pay rates in industrial awards are value judgements. The market rates over and above award rates, are value judgements. The total billable hours in the year is a value judgement. The total hours required for a project is a value judgement. Whether or not someone is willing to pay the fee calculated above, based on all such value judgements, is, you guessed it, a value judgement. For the most part many people believe they do not need to submit documents for development approval, or even have to seek development approval. It is something imposed on them which they consider unnecessary, though many of these same people belief everyone else should be controlled but not themselves. The net result is they do not believe they should pay for development approval, that such is an unnecessary cost, and anything additional to is further unwanted cost. So building design drawings, structural drawings and structural calculations are all unnecessary costs, and unwanted delays, to people just getting on with building what they want. From my viewpoint the requirement is not engineering. Engineering takes place at the frontiers of science and technology. So the required evidence-of-suitability is not engineering, and it is something imposed which did not exist in more ancient times. However there is an expectation that things are fit-for-function. Therefore there exists a demand to get this documentation provided as fast as possible at the minimum of cost. 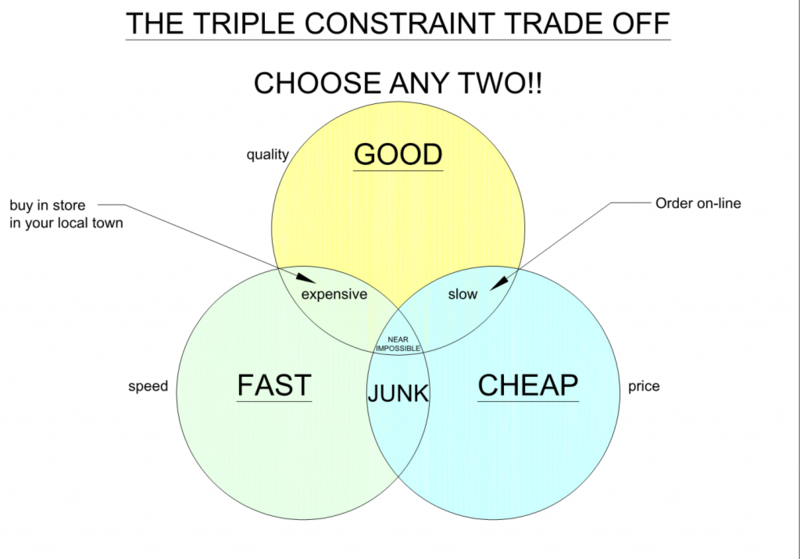 Fast and low cost, not really the sector of the triple constraint trade off triangle anyone really desires to work. Whilst on some projects we may seem to have achieved good and fast, at low price, it hasn’t been in our best interests: it is not sustainable. Mostly we achieve good and low cost, by going slow. Slow because covering all issues is time consuming, and office automation, thus far not upto covering all issues fast. So we are stuck with attempting to achieve the near impossible: good, fast and low price. So if the prices as calculated above seem too high, are perceived as too high then need some factor to reduce the total price or apply to the individual build up prices. The problem with such simplistic approach is, assuming the hours are correct, I no longer know if the fee covers acceptable wages. Whilst important if have employees, it’s also important to know that our wages haven’t dropped below federal minimum. So need a slightly more sophisticated fee calculator, and start with the federal minimum rate as the base fee. The modified calculator shows the fee as previously calculated, but with value-factors, applied to the basic hourly rate, with applied overhead also separated. The first stage for reducing the estimated fee is to reduce the estimate of the hours by getting a better estimate of the task which needs to be completed. The next stage is to reduce the applied overhead, collect more from larger projects with perceived higher value, and collect less from smaller lower value projects. Assuming can get higher value projects. On the other hand, a project may have higher perceived value because of its complexity, and risk without any change to the hours. So adjusting upwards, to $880. Everything has been combined into the individual labour rates, so could set some checks and warning signals for when the charge out rates get too low, compared to minimum labour rates. This approach allows adjustment for complexity and risk, and then consider that the market doesn’t care and bring the combined factor less than 1. It provides insight into the fact that the market doesn’t care and doesn’t value the work, and therefore all effort needs to go into eliminating the work effort. I reiterate, whilst the work is described by everyone as engineering it is not engineering, it is rational scientific design/assessment of established technologies, providing documentary evidence-of-suitability, demonstrating fitness-for-function. Most people think that what they propose to build is fit-for-function and was proven so previously, and many instances have already been built. So there is a productivity and efficiency problem regarding proof of previous installations versus future installations. This inefficiency needs to be removed: not oh! “engineers” are not valued need to change the public’s perception. It’s not engineering, it’s an obstruction, an hindrance to be removed. We’re here to help remove it. However, whilst we are here to assist remove obstructions. It is important to note the difference between past installations and future installations, and the proof required for the current proposal. Also realise that effort is still required to produce such proof. Our task is to try and keep such effort to a minimum and identify when the task is no longer “engineering” and no longer requires an “engineer”. Noting that the basic rates in the previous example have already been adjusted for limited available billable hours, I can reduce the estimated fee by adjusting the basic wages assuming can bill all standard working hours. Now have a lower starting point, and can now gain some insight as to whether the market is willing to fund the business development, admin and marketing activities. Judging that market can maybe tolerate a fee of $550.00 can adjust one or more of the value-factors. Now an average rate of $55 seems reasonable to adopt as a basic rate to keep things simple: given that internet research likely to find fees between $40 and $80, and with some charging close to $200 or more. But simple can be a downfall. Take a 40 hour job at $55/hour. The calculator is simpler but the fee is perceived as too high. Is it too high because the duration is too long, or because each and every hour is not worth $55. For such project, it is most likely biased towards drafting, say 80%/20%. The fee is now much less and the average hourly rate decreased to $41.83, and this is only distributing between two broadly based activities. If refine the activities further and determine the value of individual activities, the fee has the potential to be reduced further: though at much greater effort which should be factored into the fee. The fee also no longer allows for reduced billable hours, meaning that need for specialisation with more consistent and reliable source of work, with administration and marketing reduced to zero, and no business development. The value-factors provide insight into the changing nature of the market, the above calculator could be further refined by providing a value-factor for the applied overhead. When applied over head reduced to zero, and still need to further reduce the fee, then the whole concept of the business becomes unviable. In an attempt to standardise fees I created price blocks derived from Renard Series of preferred numbers. There are levels numbered 0 to 10. The maximum fee is $5500 (including GST), the minimum fee is $55, for services. For software a different upper limit has been set at $220 (including GST), and an assumed minimum sale quantity of 100 units. Using this approach fees are estimated using the various approaches outlined above, and then assigned to one of the price blocks. So $550 is one of the price blocks and thus reason for adjusting the fee in Example 10 above. The price blocks provide an alternative and/or complement to adjusting the value-factors. Having got a fee estimate, decide whether to assign to the lower or upper price block, depending on whether perceived price is too low or too high. But additionally decide on whether to use the price block or a customised fee. Having assigned a task to a price block, then that price is used as the starting point for other fees. For example $220 is the building block for certificates of structural adequacy for canopies. Such fees are not worked out on hours but multiples of the price block task. In this case the task is defined by rectangles containing structure needing assessment: the more rectangles the higher the fee. Business is a real world experiment, and determining prices is part of that experiment. Price is not cost plus desired profit. Price is what the market is willing to pay. If the amount willing to pay is less than the cost, then the business is not viable. The problem with using hourly rates to determine prices is that the time required is largely outside the control of the buyer. They cannot buy less hours, and if they want their project completed they have little choice but to buy more hours. So projects over run budgets and schedules. On the other hand other approaches used in the building industry are no better. Costing a building by the tonne of steel ($/tonne), or by plan area ($/sq.m) bares little relationship to real expenses. So whilst the buyer can reduce size of building and thus plan area and tonnage of steel, and so has some control on cost: the price ignores complexity of the assembly. That is doubling the material content of a structure doesn’t double the labour content. Likewise as I have indicated elsewhere the size of a building doesn’t affect the effort required for design. The design effort is proportional to the complexity of the structural form. If the structural form does not change with increase in size then the design effort does not increase. By the same measure reducing the size of the structure does not decrease the design effort. Thus the cost of design for a small garden shed should be no different than the cost for a large industrial shed of the same form. Thus if the design effort costs $2200 and the shed only costs $500 to fabricate, typically got a problem. It becomes important to distribute the design cost across sales of multiple units. As the size of building increases the number of units desired can be expected to decrease. Assume that design has to be revised to new codes every 10 years, and that sales are 1000 units per year. Then design cost distributed over sales of 10,000 units. Therefore cost of design per unit is $2200/10,000 = $0.22. But if can buy the materials for less than $500, and hope to achieve savings by taking the DIY route, then have a problem, because the material savings are not going to offset the $2200 to get a design. Unless can standardise the design, and therefore purchase a design report off-the-shelf, for say a minimum fee of $22. Assuming that the sales of such publication will be much less than the sales of actual manufactured buildings. Such publication may be worthwhile if the material savings are greater than $100. If move into business of such publications then likely to automate the design and documentation process. The question then becomes can such software be made affordable to the public? As stand alone software and one-off use, likely not viable to the public. However, if software is provided as a service (SaaS), then people may be willing to pay a small one time fee for usage: say $22. This way the customer can customise the shed/canopy design to their needs, and no need for supplier to stockpile books no one wishes to buy. It is thus important to understand when engineering starts and when the engineering is over. Shed and canopy manufacturers do not have software which does the engineering. The engineering of such structures was finished some 50 years ago if not earlier. The software carries out code compliance checks, if the proposal passes all checks, then there is adequate evidence-of-suitability to allow construction in the built-environment. Such compliance checking has less significantly value than “engineering”. Such automated specifications also have less value than custom specifications. So if price something as engineering and the engineering is long since complete, then likely to have price rejected. As I started at the top of the examples, building designers will charge somewhere around $1200 for the drawings, and rapid steel calculation services will charge $990, which produces a total fee of $2190. Which seems way too high, given I have a local market unwilling to pay $880 for drawings and calculations. I can find services which may produce drawings for less say $400 for a decking or maybe carport. But won’t find calculations for less, though may get a certificate for $600, but not much less. So using two services for the task not looking at less than $1000. We have the efficiency of one person doing drawings and calculations. So the question is what is really being sought? The drawings from the estimate can be done for less than $400, whilst the calculations can be done for less than $500. Drawings alone won’t get development approval. So messed around with different scenarios and the basic conclusion is the hourly charge out rates are whatever I say they are going to be. 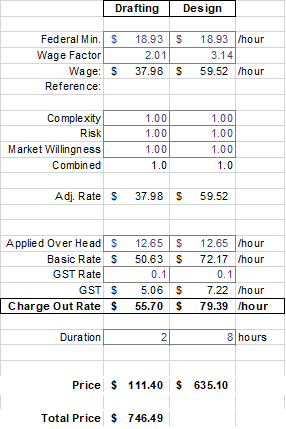 So for drafting they will be $40/hour and design $50/hour before GST: for those who want to buy time. So for a simple canopy, the structural assessment is estimated at a cost of $223.30, the nearest standardised price block is $220. So adopt $220 for rectangle having unique structure. For structural assessment of simple building the estimated fee comes out at $305.80, the nearest standardise price block is $330. So adopt $330 for each rectangle with unique structure. Note in the simplified assessment the building structure is assumed similar to the canopy structure, the only difference being the lack of wall girts and cladding. However the connections are likely to be different, as is the overall structural form. The shed type building is likely to have a rigid moment frame, whilst the canopy maybe simple beam and post construction. In other words the shed is likely to take significantly more time to assess than allowed for in the above estimate. Also note in both cases there is no drafting included. The dimension and geometry item, refers solely to reading drawings and calculating dimensions required for analysis. For these assessments I started with a fee for the item, and then calculated the time based on $50/hour, which is equivalent to $0.83/minute. Industrial engineers work in decimal minutes, and there are 480 minutes in the semi-traditional 8 hour day. This comes in at $60.50, the nearest price block is $55. Note that all the required information is expected to be on the drawings, and any additional sections required to get the information are drawn by the building design-drafter. Their job is to communicate what the building looks like, if we can’t get the required information, without further drawing, then the supplied drawings aren’t good enough. If we have to produce drawings to get all the required information, then the fee obviously increases. It is also to be noted that such fees do not include any component for management or coordination with others, nor site inspections or supervision. This is purely an assessment exercise, with a simple summary certificate issued. To go beyond a summary certificate to more formal report need to add a minimum of an extra 2 hours. So 2x$55=$110 including GST. So fees adjusted to $330, $440, and $165. Assessment can be done with a pocket calculator, no writing anything down. Or it can be done with multiple workbooks and software packages, there is no big button which prints out a report. The contents of the report have to be decided, then the appropriate printouts obtained from a variety of software, then have to be assembled into a report which attempts, for want of better description, tells a story. There is thus extra time required to document the path taken rather than just the destination. If the process gets to complicated then, the process gets documented as a matter of course as its the only way to know where we are in the process. Having now determined a fee for a individual beam, can break a building down into beams and produce a new fee estimate for a building. The result is $610.50, nearest price block is $660. In the previous assessment the total fee for the portal frame (rafter & column) was $90, whilst it is now 2 similar beams x $55=$110. And each beam is assumed to have different left and right hand connections, and supports. The wall cladding is assumed cut up to allow various openings for doors and windows, thus affecting span and spacing of wall girts. Whilst column2 refers to the columns in the bracing system, which have different loadings to the typical portal frame columns. Some would could consider this a more realistic fee, as the earlier fee is under cutting them. Now I don’t have superduper software for steel frame analysis. Multiframe is good but it doesn’t determine design-actions, though it has some partial ability to do do, nor does it design connections or footings. 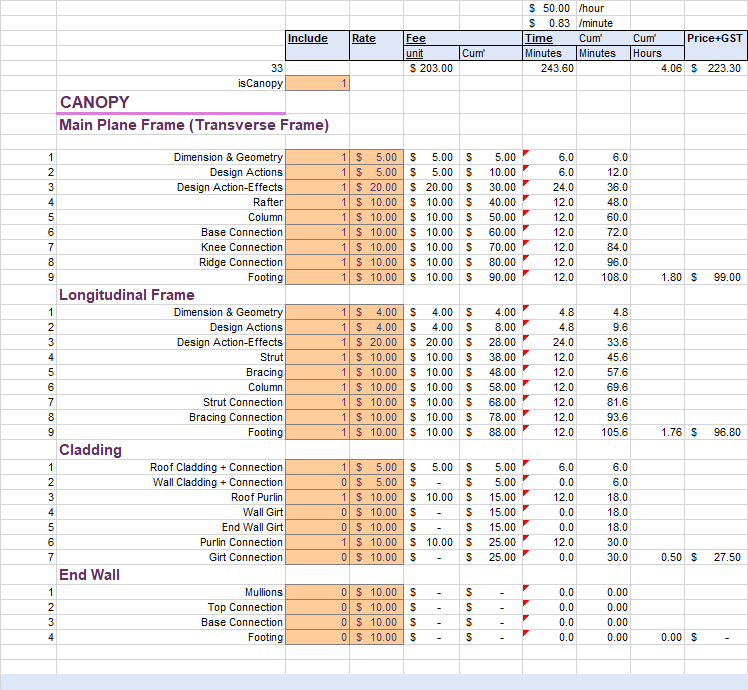 So can I get the fee to $990 to match competitors with superduper software with their wind tunnel simulator. Which as far as I can tell from sample report doesn’t check connections (there’s a surprise: add sarcasm), nor does it involve any drawings. But it is reportedly for any steel frame. Well standard designs in the past we charged $550 and then $990, these included drawings, we didn’t have Multiframe or Microstran, we used in-house plane frame program, and task was to find the maximum height achievable not simply check something was ok!. However working with building designer, and steel erector, and producing structural drawings and calculations the fee likely to be closer to $2200. So any building involves ripping columns out, installing carry-beams, and having involved front gables with integrated office. Unless the office has a trafficable or heavy storage ceiling, the office space is by others. The others being timber framing companies or light steel house framing companies. So main differences with gable end wall, are additional end wall mullions, support beams and door framing. Also removing columns from the portal frames, makes the structure change from a series of typical 2D portal frames, into a 3D structure. The frames are no longer typical, there are frames with 2 columns, 1 column and no columns. there are then full frames which support the cropped frames. 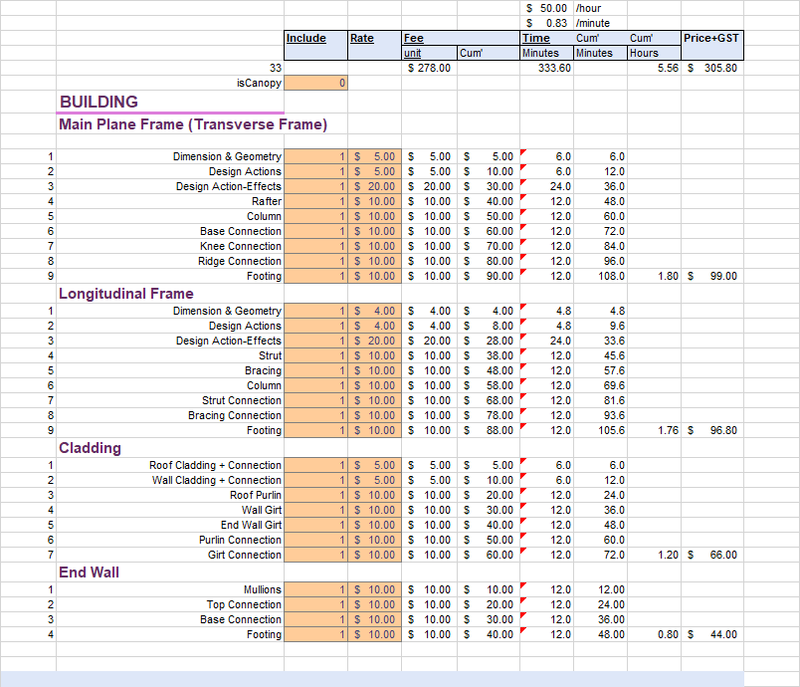 The number of different frames varies from project to project and is more complex than simply throwing a carry-beam in to support the rafters. The structure is not like a house structure and is not as simple as just throwing a lintel in. So at $55/hr, the $550 requires 10 hours, the fee of $990 requires 18 hours, and $2200 requires 40 hours. And producing a calculation report and drawings, not a certificate. So next examples I will break down the detail of drafting and design for a larger project.